Wraps are a really great and delicious way to serve your daily greens and veggies. And as this wrap is a green wrap you’re getting even more nutrients. The wrappers alone are already super tasty and can also be eaten as a snack all on their own. I love rolling them up with crispy salad leaves and veggies which adds just the perfect freshness. Then all you need is a scrumptious dipping sauce and your meal is ready. And the best thing about these wrappers is that they’re totally gluten free, light and fat free! 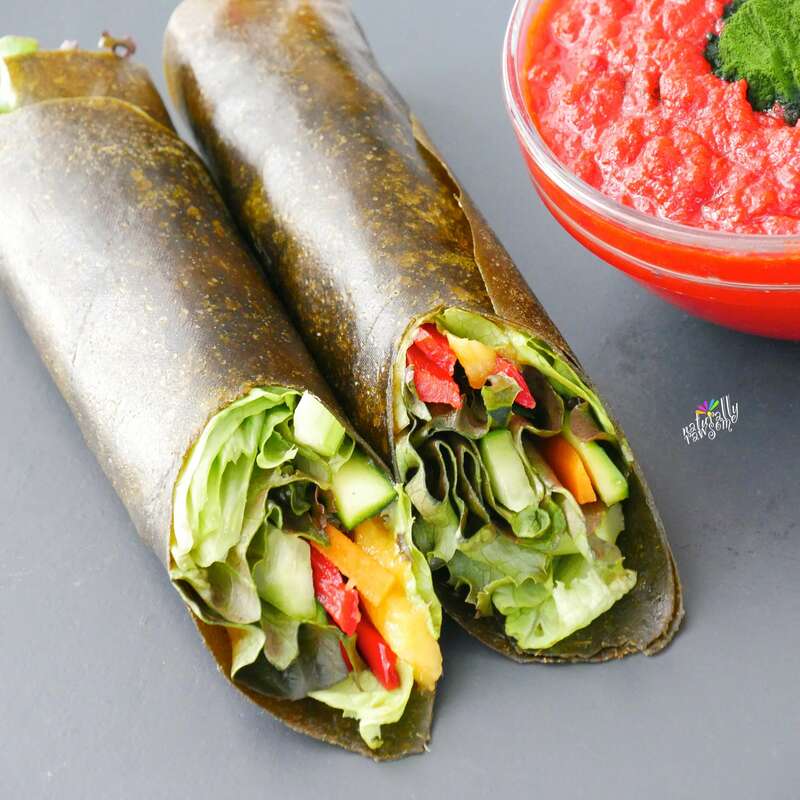 For the Veggie Wrap blend up 1 medium sized mango and about 2 cups/100g of dark leafy greens like dandelion, spinach or kale. Spread the smoothie onto a dehydrator sheet/backing sheet and dehydrate/bake it at 104°F/40°C for about 6-8 hours. The wrap should be soft and easy to peel off. Once the wraps are ready you can start chopping up the other ingredients. Julienne pepper, carrots, cucumber, zucchini and mango. Place some lettuce leaves on one end of the wrap. Add some peppers, carrots, cucumber, zucchini and mango and start rolling it up tightly. Wetten the end with a little bit of water. This way it sticks onto the wrap to seal it. Serve it with your favourite dipping sauce. Note: If you don’t have the time, or don’t want to make your own wraps you can also use Nori sheets.